Here are 8 simple rules to make your training more effective. If there’s one fatal flaw of the die-hard fitness fanatic, it’s that she always wants to do more — more sets, more workouts, more intensity, more weight. This is fine — to an extent. But somewhere along the line bad things start happening: Muscles cease to respond, fat loss stalls, performance suffers and injuries arise. These are all signs that it’s time for some R & R — rest and recovery. The notion of rest and recovery can be vexing, especially if you’ve got specific goals in mind or an event coming up; you want changes to happen sooner rather than later. But truthfully, R & R is key to achieving your goals, maybe even more so than the actual 60 minutes you spend working out. Skeptical? Then read on. These eight rules of R & R will help you understand why this aspect of your training is so important and how to do it properly to get the results you desire. Rule No. 1: You have permission to be a couch potato. Every training program should incorporate at least one — if not two — full rest days every week. That means no jogging, no biking, no stepping foot into the gym. Period. Of course, you can run your mouth, surf the ’net and exercise your right to watch TV, just so long as you do it without breaking a sweat. Here’s the deal: Demanding workouts cause countless microscopic tears in your muscles — tears you actually want to incur because when they’re repaired, your muscles grow bigger and stronger. And when do they get repaired? When you’re exploring the horizontal plane of your couch. But that’s not all. “When you rest, hormones also return to normal, cells resynthesize glucose and store it in your liver, and blood fat levels decrease,” says Michele Olson, Ph.D., a professor of exercise physiology at Auburn University at Montgomery in Alabama. “If you exercise too soon, you derail these processes and your efforts won’t produce desirable results.” Adequate rest ensures that your body returns to a state of equilibrium, and once you’re in balance, it’s time to return to the gym, hit it hard and heavy, and start the cycle all over again. Not all rest requires complete abstinence from exercise. In fact, active rest can help you recover from an intense workout week, albeit in a different way. Gentle activity such as walking, easy swimming, and Vinyasa flow yoga helps mobilize your muscles to flush out toxins and inflammation, according to Olson. A duration of 30 to 60 minutes one to two days a week is what is recommended most by experts, especially after intense workouts, but again, the whole purpose is to facilitate recovery, so make your activity easy, enjoyable and leisurely. When doing supersets or circuits, go through the required number of moves, then rest 60 to 90 seconds between rounds. For HIIT cardio, work at a 1:2 or 1:3 ratio of work to recovery (i.e., for every 20 seconds of sprinting, recover for 60 to 90 seconds). Training intensely is a requirement for changing your body, but going pedal to floor day after day is simply not sustainable; your body will eventually break down and become injured. Alternating difficult workout days and weeks with more moderate ones will keep your body guessing, accelerating results while also allowing you time to recover. Sit down with a calendar and assess your program over the next month. Schedule no more than two to three weeks of heavy, intense training in which you push yourself in terms of weights, reps and sets, as well as intensity, then follow those up with a week of more moderate “deloading” work. When deloading, you should still be working pretty hard without pushing your one-rep max, for instance. Instead, shoot for endurance with both your strength training and cardio, and focus on often-overlooked things such as range of motion, proper form and joint stability. You also can cycle your difficult and moderate workouts during the course of a week. Do no more than one to two days of super-intense training such as HIIT, Tabata or heavy lifting, and follow it up with a day of full rest or an active recovery day to give your body a break, Olson recommends. Most of us turn a deaf ear to our bodies, even when they are screaming for a break. Overtraining is a common occurrence among fitness die-hards, and in the long run, it kills progress and promotes injures. If you’re experiencing a number of these overtraining symptoms, it’s time to throw in the gym towel. Add another full rest day to your program and scale back on your intensity and/or volume for several weeks to get back on track. Ingest plenty of fibrous, green vegetables to combat inflammation caused by training, as well as quality protein and healthy fat to accelerate muscle building and repair. Of course, it goes without saying to avoid processed, preserved, packaged goods with unpronounceable ingredients as well as saturated and trans fats. And very important: Don’t forget your liquids. “Our cells live in an aqueous state, and they must have water to function properly, process energy and provide energy for muscles to contract,” Olson says. Shoot for drinking a half-gallon of water a day, more if you’re close to a restroom. Finally, it’s important to eat properly around your workouts. Olson recommends eating some fruit and an easily digestible protein like low-fat yogurt (half a cup) two hours before exercise. “Your muscles need more carbs than protein to fuel you through your workout,” she says. Within 60 to 90 minutes after training, she suggests ingesting 2 ounces of tuna, half a cup of skim milk and half of a whole-wheat bagel. Making whey protein powder a part of this meal is acceptable for convenience sake if whole food is unavailable. Rule No. 7: Get at least eight hours of sleep every night. When you’re in full shutdown mode — i.e., sleeping — your body gets to work reconstructing itself. But is eight hours really the magic number? Many experts believe it’s the minimum. Case in point: A Stanford University study found that female college tennis players who got 10 hours of sleep a night ran faster sprint times and made more accurate shots than they did when sleeping nine hours or less. Those who train in the wee hours of the morning are most likely getting shortchanged on sleep, and a 2014 study published in Chronobiology International found that early morning workouts significantly reduced sleep duration in elite athletes and an association of less sleep with higher levels of fatigue. So if you like to train in the morning, be sure to find a way to get in your minimum eight hours, come hell or high water. Or if you do stay up late binge-watching Orange Is the New Black on Netflix, squeeze in a nap during the day to make up for it. A study in the Journal of Sports Sciences found that sleep-deprived athletes benefited physically and cognitively from taking a 30-minute post-lunch nap. • Warm up beforehand to get some blood moving into your muscles. • If you’re new to foam rolling or sore from training, expect some pain. Think: deep-tissue sports massage — not particularly comfortable but darn effective. • For the first two weeks, roll for five to 10 minutes each workout day until it becomes more comfortable, then move up to 20-minute sessions if you like. • Roll along a muscle until you find a “hot spot.” Then hold there and breathe deeply as the spot relaxes and stretches out. • Spend an even amount of time on each bodypart: one to two minutes at first, working up to longer periods over time. If an area is particularly sore, spend an extra minute or two on it. • Breathing is important. It relaxes your mind and body, allowing for a deeper and better rolling experience. If you want your body to perform, you need to give it some TLC. Here’s how to recover properly. What you do on your days off could make a world of difference in your training results. Are You Pushing Too Hard? Make sure that your dedication to fitness is working for you, not against you. 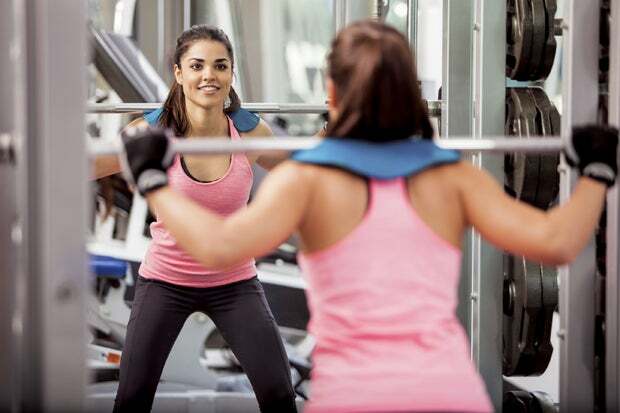 Here’s Oxygen’s take on overtraining, and how you can steer clear and stay in shape. Stress is a fact of life — but it’s also controllable if you attack it with exercise and diet. Follow these simple guidelines to help keep anxiety in check. You’ve gone to the gym, lifted some weights, maybe even did some cardio and broke a sweat. But was your workout effective? Here are 6 ways to know. High-intensity interval training and efficient circuit strategies allow you to reach your goals in less time. These four training offenses are undermining far too many women’s fitness goals. Here’s how to fix them. Only three pieces of equipment mean one-stop shopping and a quick, effective workout, no matter how much time you’ve got. Stay on top of your game by tweaking your training to soothe sore muscles.